A remarkable selection of Chinese blue and white porcelain dating from the late 16th to the early 18th century has just been sold at auction by Toovey’s in their December specialist Asian Art sale. 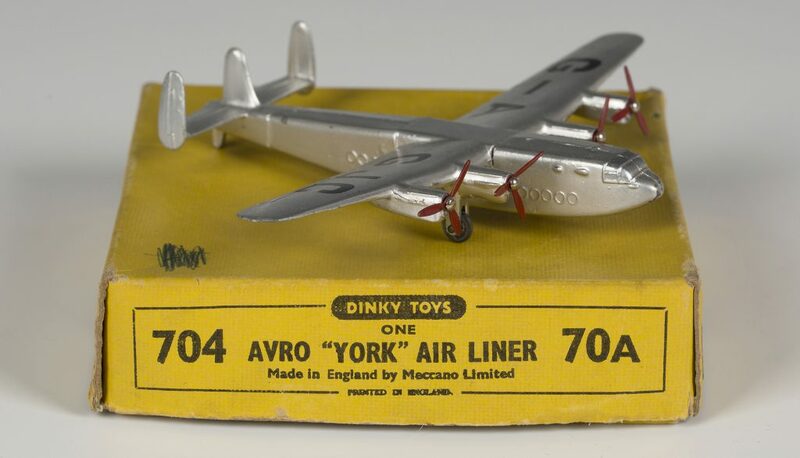 This important collection was bought in the 1960s and 1970s in London. Its sale attracted international attention. 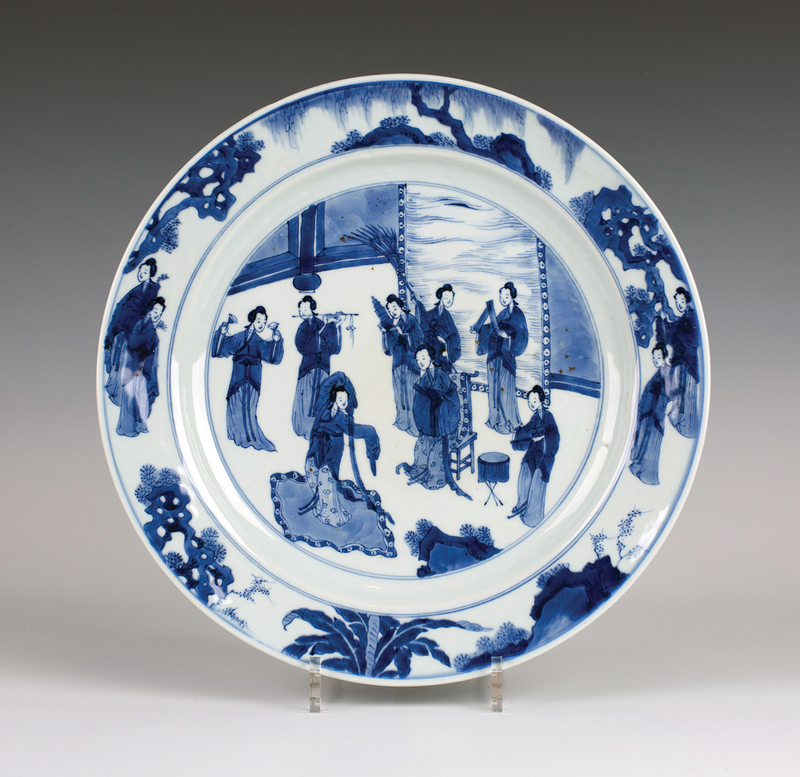 Chinese blue and white has from the 16th century appealed to an international market. The decorative designs of late 16th century blue and white porcelain had been characterized by panels filled with flowers, precious objects and Buddhistic emblems in often repeated patterns, contained within compartmentalized borders. These motifs can be seen on the Wanli period Kraak porcelain dish seen here. The Manchu threat meant that money was diverted to the Ming army which, together with the luxury and corruption of the Court of Wanli, deprived the kilns at Jingdezhen of imperial patronage. This had a liberating effect on the Jingdezhen potters and by the time of the death of the Ming Emperor, Wanli (1572-1620) a noticeable shift in the design and decoration of Chinese porcelain had occurred. This new and exceptional work would span the late Ming and early Qing Dynasties and is therefore termed the ‘Transitional period’. The Transitional style was more painterly than anything that had gone before. 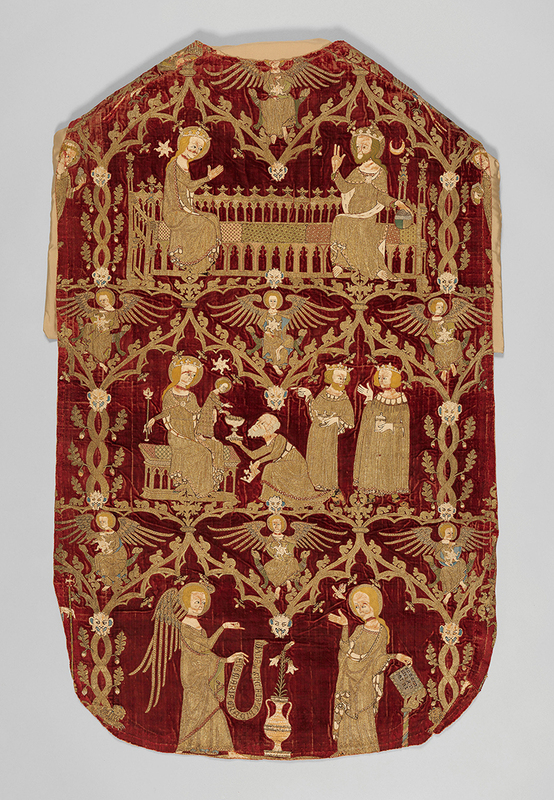 It is filled with movement; the figures appear natural and at ease. Perhaps it was influenced by the tastes of the Dutch merchants for whom much of this blue and white porcelain was produced. The decoration of Transitional period porcelain typically employs naturalistic themes depicting, beasts, flowers and most especially figure subjects. 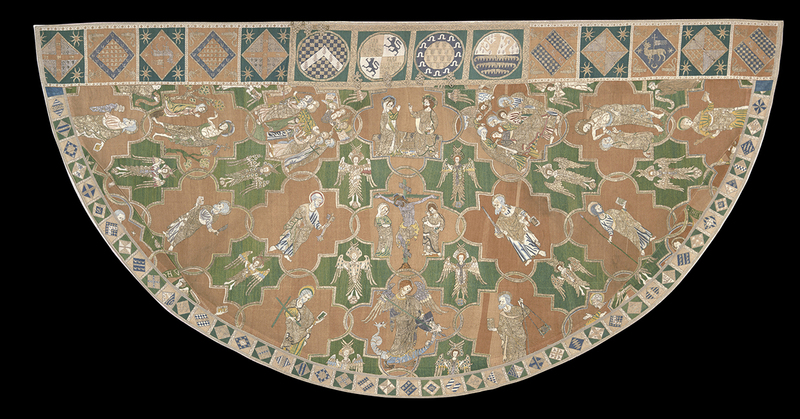 Figure subjects on Transitional wares are often united by a narrative following the traditions of Chinese opera which incorporated music, song, dance and acrobatics as well as literary art forms. The finely painted ‘bitong’ or brush pot illustrated dates from the mid-17th century. It is a fine example of Transitional period porcelain, decorated with a continuous scene depicting horses and three female acrobat riders galloping through a woodland landscape with trees, rocks and mist. 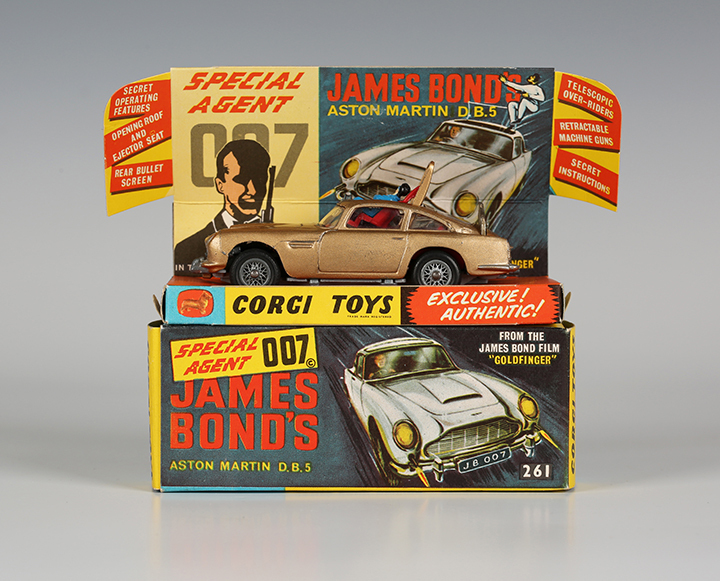 This rare object, measuring 22cm in height, realised £37,000 in Toovey’s December specialist Asian Art auction. The Transitional aesthetic would continue into the first twenty years of the reign of the Qing Emperor, Kangxi (1662-1722). Kangxi was the fourth and arguably the most famous Emperor of the Qing Dynasty. His reign was marked by long-term stability and a period of relative prosperity. 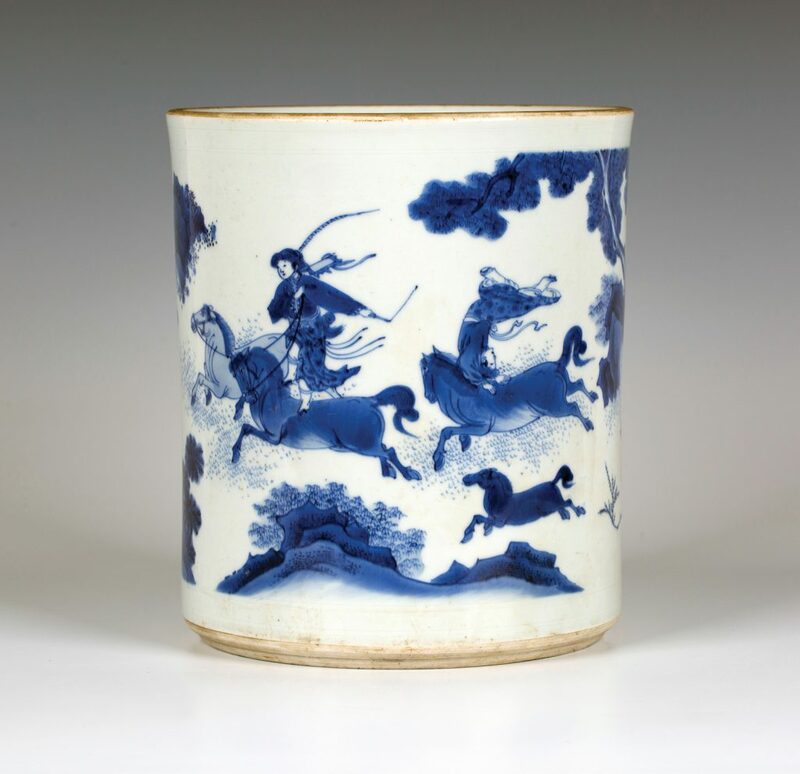 The Kangxi period is renowned in the history of blue and white porcelain. In 1683 the Imperial Court appointed a director of the factory in Jingdezhen. 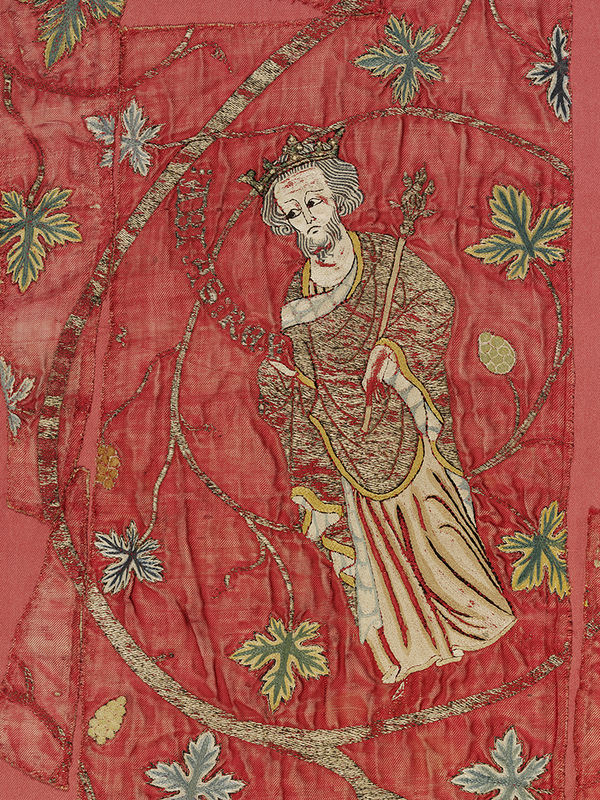 The restoration of court patronage raised standards even further. The exceptional quality of the painting and clear cobalt blue distinguishes Kangxi blue and white porcelain and is apparent in the decoration of the brush pot seen here. Our eyes are met by a continuous scene reminiscent of the Transitional with poets and attendants indulging in scholarly pursuits. Some sit at a table playing Weiqi whilst a lute is played. Two figures and an attendant look on as a scholar writes. 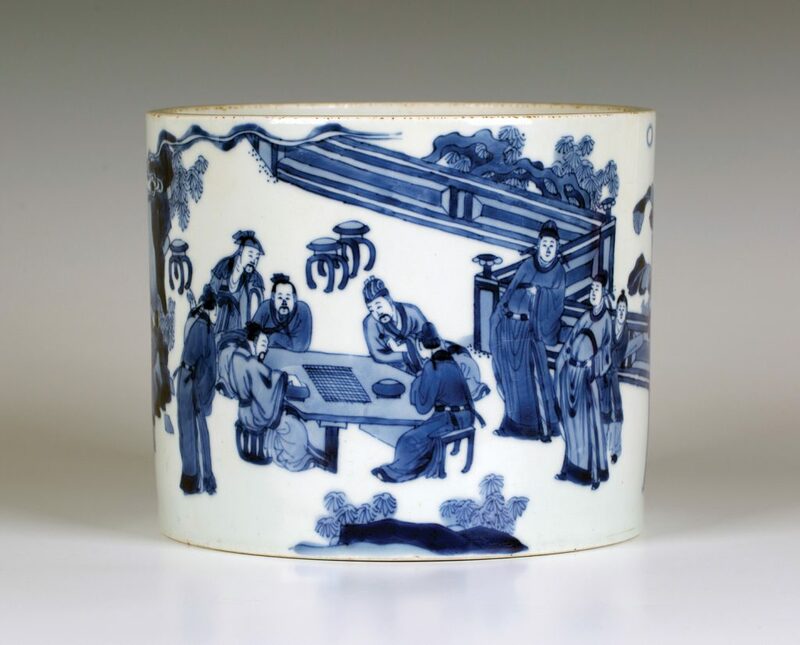 It fetched £30,000 at Toovey’s reflecting the international appeal and technical brilliance of Kangxi blue and white porcelain, which many ceramic historians believe has never been surpassed. If you would like more information or advice on your Chinese porcelain and works of art email auctions@tooveys.com or telephone Toovey’s specialist, Tom Rowsell, on 01903 891955. Contemporary British Realist painters are leading a renaissance in figurative and landscape art. Many of them are members of the New English Art Club. The New English Art Club was founded in 1886 as an exhibiting society for artists influenced by French Impressionism, whose work was rejected by the then conservative Royal Academy. Artists included James Abbott McNeill Whistler, Walter Sickert, John Singer Sargent and Philip Wilson Steer. Today members of the New English Art Club continue to paint in a realistic, figurative style. Amongst the youngest of these is Peter Brown (b. 1967) who was elected to membership in 1998. 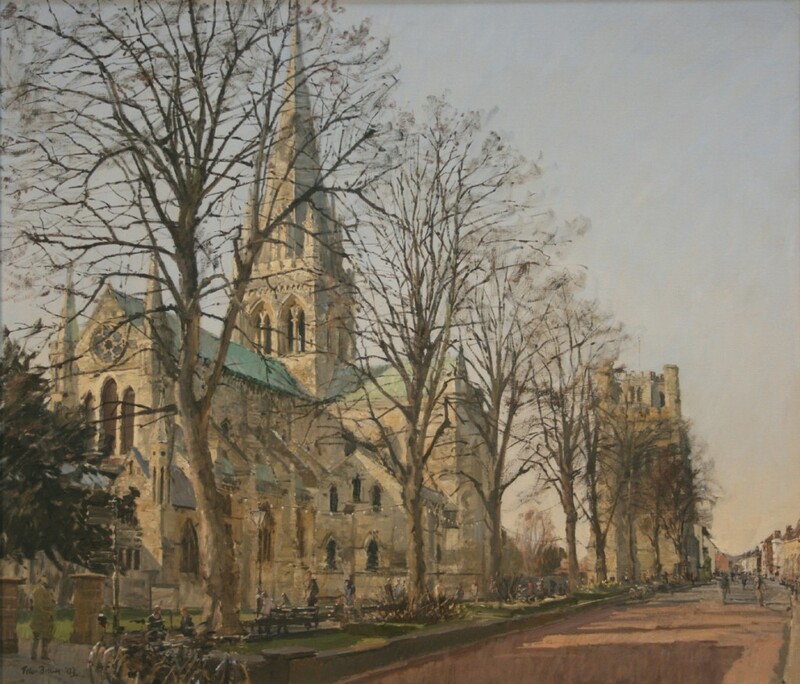 He paints street scenes and city landscapes directly from his subjects, like the winter view of Chichester Cathedral in West Sussex. He works ‘en plein air’ in all weathers drawing inspiration and energy from his engagement with passers-by. Bernard Dunstan (b.1920) was elected to the New English Art Club in 1946. He studied firstly at the Byham Shaw School of Art and then at the Slade School of Fine Art between 1939 and 1941. He is best known for his studies of figures in interiors, especially nudes, which he paints in the Anglo-French tradition of the late 19th and early 20th centuries. 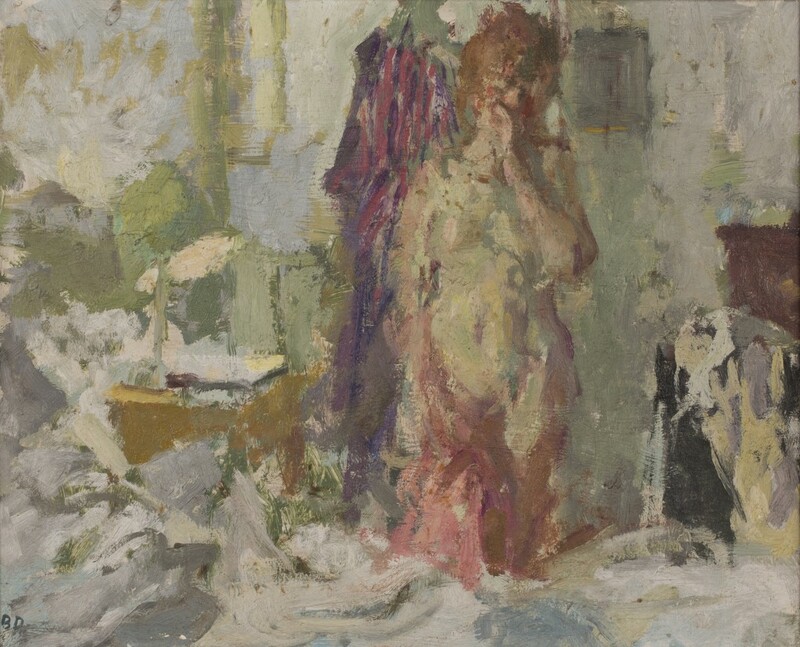 The Slade’s emphasis on swift, decisive lines drawn from the model can be discerned in the freedom and movement of light in Dunstan’s oil, ‘Going to Bed’. The artist Ken Howard (b. 1932) is often quoted as saying “For me painting is about three things…revelation, communication and celebration.” He studied at the Hornsey School of Art and was elected as a member of the New English Art Club in 1962, serving as President between 1998 and 2003. His work combines keen observation with fine draughtsmanship and tonal precision. 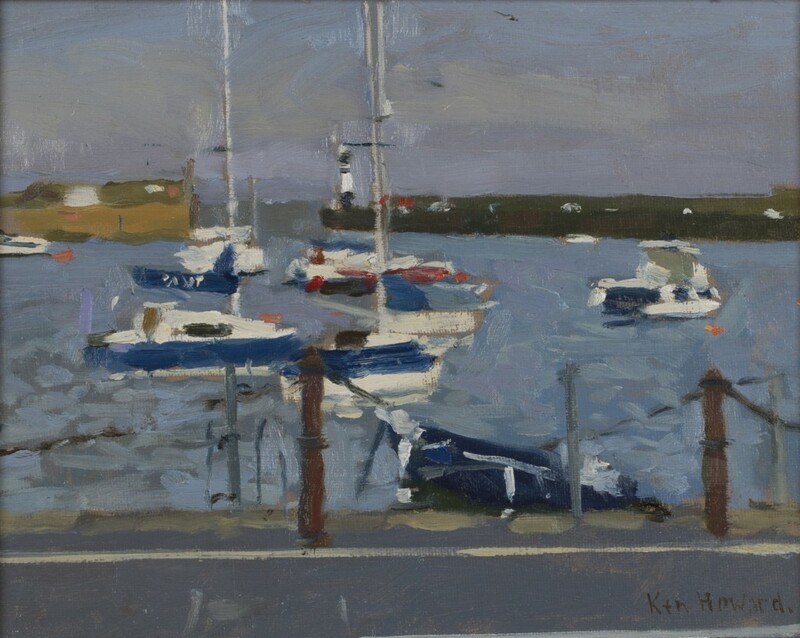 Light is the overarching inspiration in his paintings as can be seen in the oil ‘Newlyn High Water’. His subjects include Venice, London, Cornwall and Studio nudes. Like all these artists, Ken Howard allows us to glimpse something beyond our immediate perception by using the particular vocabulary of his painting and style to communicate his vision of the world around him. 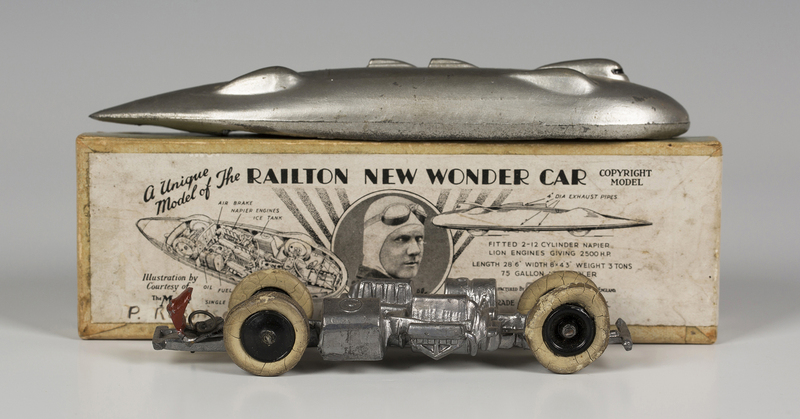 In this he uplifts us, celebrating human dignity and a sense of wonder in nature. For me there is a subtle irony in the apparent role reversal whereby today the Royal Academy embraces the abstract and contemporary whilst the New English Art Club is overseeing a renaissance in contemporary realism and draughtsmanship amongst this spirited and talented group of artists. Prices for these artists range from the low thousands into the tens of thousands of pounds at auction, which clearly affirms collectors’ delight in Contemporary British Realist art.